In Year A of the liturgical season, the gospel readings at mass highlight Matthew, the first book in the New Testament as we find it now. Since the liturgy can present only short selections, an overview of the book itself and what is found in current scholarship about its background, the author and the meaning, can be helpful for a fuller understanding. Some of this will be taken up in the weekly notes I make available, but here is an overview. Who is ‘Matthew’ the writer? None of four gospels identify their authors but early tradition gave them the names we use. The title of first gospel could be no more than a guess from the fact that the name ‘Matthew’ is only found in this gospel – in the call to the tax collector who is also listed as an Apostle. (Mark and Luke in the same sections have the name ‘Levi’.) If the tax collector is the author, it seems odd that little or none seems to come from personal knowledge of Jesus’ lifetime but so much from Mark and sources shared with Luke. Without reliable biographical details, I look at what we can learn from the book itself. ‘Matthew’ organises the writing well, is reverent, reflective and completely dedicated to Jesus and his teachings and what it means to be a disciple of the Lord. 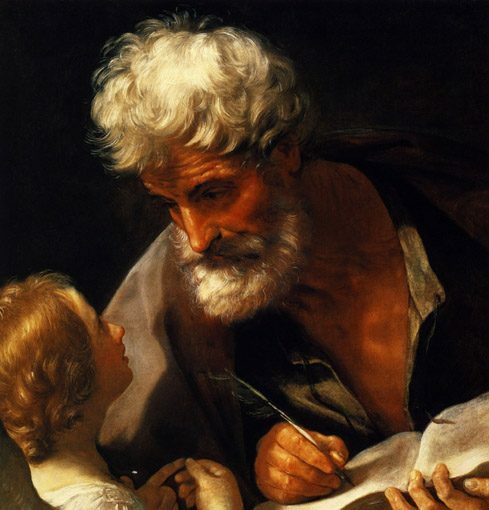 Matthew is seen as the ‘most Jewish’ of all four gospels, even in the language. Where Luke and Mark, for example, have ‘Kingdom of God’, Matthew usually has ‘Kingdom of Heaven’, a more Semitic term. All of the gospels show how the Old Testament foreshadowed Jesus, but Matthew has more direct quotations, ten of them using the formula, ‘This happened to fulfil the words….’ (There are other passages which suggest this more subtly.) While noting the continuity of Jesus to the past, the book also stresses that in Jesus there is something entirely new and unexpected. This starts with the opening of the Gospel in which Matthew gives Jesus a legal Jewish descent though Joseph from David and Abraham and then comes a break with the past: Mary is with child by the power of the Holy Spirit and not a human father. Matthew shows Jesus using the rabbinical style of debate when talking to other Jews. In his commentary on the gospel, Daniel J. Harrington suggests that Matthew was in a struggle with the followers of the Pharisees to be the rightful successors to the faith of the Old Testament. This means sections that are less interesting in our time or even sound ‘anti-Semitic’. Matthew does stress lasting parts of the Jewish Law while Jesus makes significant changes. ‘You have heard it said… but I say to you…’ is used a number of times in Matthew 5:17-48. Gentiles, however, play an important part, from the visit of the Magi on to the last words of Jesus. Harrington thinks that Matthew worked in a mixed community of converted Jews and Gentiles. Matthew makes a point of noting geographic locations of Jesus ministry, often tying them to an Old Testament prophecy, as Galilee in 4:12-16. This gives them symbolic value. A major feature of the gospel are the five blocks of Jesus’ teaching, and these instructions for living as a disciple made it a favourite in the early church. The best known of the five is ‘The Sermon on the Mount’ which takes up three chapters. In it Matthew gives us our usual version of the ‘Our Father’ (‘The Lord’s Prayer’) and the ‘Beatitudes’ (5:1-10). Only in this gospel is the Last Judgement (25:31ff) which has inspired so much Christian art. Although punishment for sin is part of Matthew’s faith, the parable of the Last Judgement is far more about how Jesus identifies himself with all those in need to the point where anything done for them is done for Jesus himself. This is an example of how Matthew shows the closeness of Jesus to his followers. Throughout the gospel, we see Matthew’s concern with the preparation of the disciples. This appears early, for immediately after Jesus starts to proclaim the coming of the Kingdom of Heaven, he calls the first disciples (4:18-22) and right after this, he begins his teaching to them. Although the instructions were historically spoken to those around Jesus, most of these apply to our own lives. For the liturgy, selections are chosen predominantly to fit into the feast structure of Advent-Christmas and Lent-Easter season and therefore do not follow the book sequence as it appears in the Bible. At some time during Year A, I suggest you read it consecutively to have a better sense of its form and development. For reflective reading or personal prayer, however, it is better to take short passages, and see how they speak to you. If you want to study the gospel in more detail than the weekly liturgy background, there are numerous study guides and commentaries in varying levels of scholarship, various lengths and amount of spiritual reflections. Look in bookstores and online. There are good notes in some Bibles, including The Jerusalem Bible. I use a number of commentaries for the weekly readings and will name them when quoted. I hope that all of will find spending this year with Matthew rewarding, comforting, and inspiring – but also at times challenging! as all these are one of the purposes of reading and thinking about scripture. In Matthew Jesus becomes ‘present’ to us and we can learn more about Jesus’ life and his place in our lives by reading this Gospel.